The Supreme Court ruling on the Affordable Care Act paves the way for profound changes in the healthcare industry and real estate investments catering to this sector. Healthcare providers and states can now move forward with less uncertainty about the future of this plan and its requirements, but continued challenges to the ACA and the risk of repeal under a Republican-controlled executive and legislative branch following the upcoming elections will continue to impede progress. 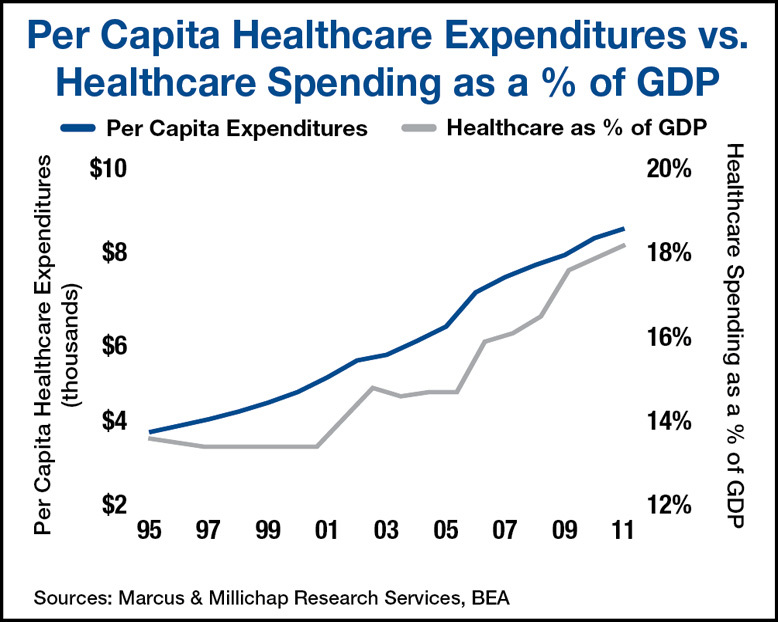 Several sectors of the economy will benefit from the Affordable Care Act, with demand for healthcare services likely to increase dramatically beginning in 2014 when most of the provisions are activated. By January 2014, the ACA will add up to 32 million Americans to the ranks of the insured, fueling demand for additional healthcare services and facilities. The Supreme Court did rule, however, that states can opt out of the Medicaid expansion portion of the bill, which will insure 17 million of the 32 million covered residents. Considering 26 states sued the federal government over the Medicaid provisions, the likelihood that some states will opt out remains prevalent. Nonetheless, 90 percent of the costs of adding more residents to Medicaid rolls will be covered by federal dollars, making the pressure from healthcare providers and constituents significant, effectively limiting the number of states that may choose not to participate. States with significant fiscal challenges and a large number of residents that would qualify for Medicaid will be the most likely candidates to pursue a “go-it-alone” strategy. Small-business owners face a significant implications from the healthcare bill, particularly those with 50 or more employees. The fines for not providing healthcare to employees are steep, and many small-business operators may be inclined to keep staffing levels near 50 workers until demand justifies the addition of 10 or 20 jobs. As a result, industrial incubator space could be adversely affected by the ACA. Overall vacancy in the sector will finish the year 180 basis points below the recessionary high, though most of the absorption will come from large companies in a few select markets. The medical office sector is poised to reap the benefits of a fresh windfall as a result of the act. At current utilization rates, an additional 60 million square feet of medical office space will be needed in order to meet the demand surge. While efficiencies are built into the bill that will likely tighten that figure, the construction pipeline remains insufficient to meet the space demands anticipated in 2014. According to preliminary estimates, medical office vacancy was 10.8 percent in the second quarter and will continue to fall through the end of this year. Demand for seniors housing accelerated in the last 12 months and will continue to grow. Since Medicare and Medicaid currently pay for nearly 80 percent of the skilled-nursing care in the U.S., a change to reimbursements will have a significant impact on the sector. Rehabilitation hospitals, for instance, may see a cut in revenue as Medicare funds are reallocated to other areas. On the other hand, more people will qualify for Medicare to stay in long-term care facilities. The impact on the other two sectors, independent living and assisted living, will be considerably smaller. This entry was written by marcusmillichap, posted on June 29, 2012 at 11:55 pm, filed under Research and tagged Commercial Real Estate, Healthcare. Bookmark the permalink. Follow any comments here with the RSS feed for this post. Trackbacks are closed, but you can post a comment. I wouldn’t mind creating a post or elaborating on a lot of the subjects you write concerning here. Again, awesome website! good day everyone, Thank you for sharing. Everyone here are appreciative followers ! ola ! Hello there, tidy webpage you have here.